Home / News & Events / News / Career Tracks Goes Live!! As we continue to work together to complete the launch of Career Tracks at UC Santa Cruz, we are pleased to offer several upcoming events. Employee Town Hall Webinars: The Results are in! If you didn't attend an Employee Town Hall last month, you still have the opportunity to attend a project wrap up presentation that gives a recap of the Career Tracks results. One-on-one sessions with a Career Tracks team member to discuss any questions regarding your Career Tracks classification. Covered topics could include opportunities for reconsideration, Q&A and discussion of Career Tracks family, function, and level. The goal of Career Tracks is to group jobs into more clearly defined families and functions that better align with comparable jobs in other UC locations and in the external labor market. The vision is to implement Career Tracks at all UC campuses and medical centers over the next few years. Senior Management Group, academics, represented staff, and students are not affected. Career Tracks will not affect job duties or function, working ("business card") title or current base pay. Career Tracks has replaced UC's outdated job classification framework with a market-based system for all non represented employees. Information will be posted as dates are added at the News & Events page on the Staff HR Career Tracks website. 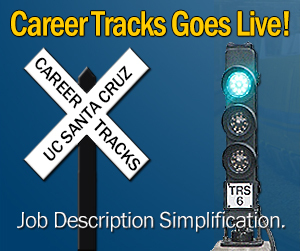 For questions and concerns please reach out to the Career Tracks team: CareerTracks@ucsc.edu.